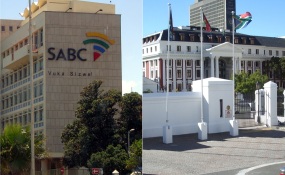 The resignation of two SABC board members, with a third on the cards, come in the wake of political pressure being brought to bear on the board of the embattled public broadcaster. News24 reported on Tuesday that John Mattison and deputy chairperson Khanyisile Kweyama had resigned and that a third resignation, that of Krish Naidoo, was imminent. The board is determined to forge ahead with retrenchments of more than 900 staff and 1 200 freelancers as part of a turnaround strategy to save the ailing broadcaster. But the move has been met with outrage from parliamentarians, unions, opposition parties and the government. A reliable source who has first-hand knowledge of the board's affairs told News24 on Monday that "it was clear" newly appointed Communications Minister Stella Ndabeni-Abrahams was intent on pushing the board to breaking point, using retrenchments as the wedge issue. This is evidenced by a letter she addressed to the board over the weekend, following her first ever meeting with the board last Thursday, in which she declares her intention to stop engaging with the board. In the letter, Ndabeni-Abrahams claimed the board flatly refused to give an undertaking that it would not retrench staff if a cash injection of nearly R3bn could be found. On Tuesday, DA communications spokesperson Phumzile van Damme slammed the ANC for meddling in the ongoing "chaos" at the SABC. "We are also aware that the ANC is allegedly trying to collapse the SABC board by rendering it inquorate and therefore unable to make any legally binding decisions. It is election season, and the ANC does not want an independent board. The SABC is key in communicating the ANC's "good story" and an independent board that won't take instructions (as we saw this weekend with the new minister) would be most undesirable for the ANC," Van Damme said in a statement. Van Damme added that Naidoo "was asked to resign from the board by Luthuli House" a reference to the ANC headquarters in Johannesburg. She also confirmed in a statement issued on Tuesday that Mattison and Kweyama had resigned. A source close to the Communications Ministry told News24 that Mattison and Kweyama had resigned to protests against how some members of the board had treated Ndabeni-Abrahams during their meeting last week. News24 understands however, that tension between members of the previous interim board and newer appointees have been simmering for some time and this, coupled with the disastrous stance by Ndabeni-Abrahams, may have contributed to their sudden departure. The pressure being brought to bear relating to the retrenchments and the results of an Special Investigating Unit (SIU) probe into irregularities surrounding a R185m security tender, are far more likely causes for the resignations, the board source explained. According to the source, board chairperson Bongamusa Makhathini's insistence that allegations of the irregularities in the tender, awarded by the interim board, be investigated had caused some bad blood. Makhathini has also restricted the number of meetings for which members could claim reimbursement to the bare minimum in a further effort to cut costs. The chairperson was allegedly incensed when he arrived at the SABC in October only to discover that interim board members had been paid between R500 000 and nearly R1m in total for their work between March and October 2017. Kweyama and Mattison were members of the interim board and attended 64 and 68 meetings respectively during the time period. This was revealed in a parliamentary response to questions from the DA earlier this year. According to the source, the drastic cut in the number of meetings also led to further bad blood, as the sudden reduction in income for some of the board members. Van Damme said she hoped that the results of an SIU probe into the irregular security tender were not the cause behind the resignations. "The tender was awarded to Mafoko Security by the interim board in 2017, despite it being ranked second in a bidding process. The interim board allegedly overruled its own supply chain processes, ignored National Treasury and its own lawyers' advice in awarding the tender to Mafoko," Van Damme said. She added that the SIU found the contract was awarded irregularly and that there was financial misconduct in terms of the Public Finance Management Act. The SIU told Parliament this week it was "preparing criminal and disciplinary referrals" over the matter. It had submitted an interim report to President Cyril Ramaphosa on November 30 and provided an update to Makhathini in September. According to Van Damme, the final report is to be finalised by March 31, 2019.